If you look at paintings ‘back in the day’ you’ll see running horses depicted with forelegs stretched out in front, and hind legs stretched out to the back. Charming now, yes, but back in the 1800s they didn’t understand exactly how a horse moved and which hoof went where, and when. What?! To satisfy popular debate on the topic, Muybridge was commissioned to prove, through photography, just how a horse trotted. Using a line of cameras that were each triggered by a thread as the horse passed, he did show that a horse is actually airborne (without a hoof on the ground) during part of the trot (although the negative was later lost). Muybridge expanded the study to include the gallop, and the photographic stills were compiled (sort of like a ‘flip book’) to show the movement sequence. It’s those images that survive and are included in the Google Doodle, which is actually animated. 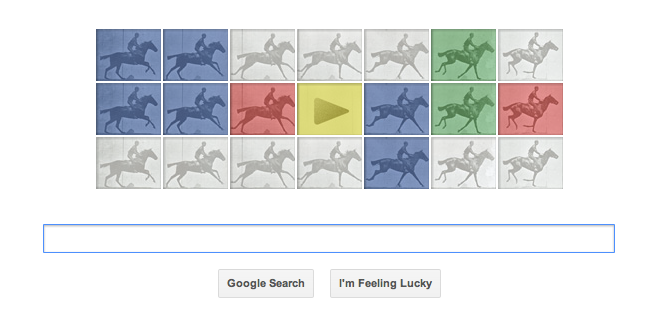 You can read more at the Eadweard Muybridge Wikipedia page, or head to the Google page today to view the video. If you missed it (on April 9, 2012), you can head to the Huffington Post for a look at BOTH videos, the Google Doodle (complete with old-timey music, hoofbeats, and a fun horsey sound at the end) and the original Muybridge sequence in black and white. Here at No Biz Like Horsebiz, where we love horses AND movies, we wish a Happy Birthday to Mr. Muybridge!